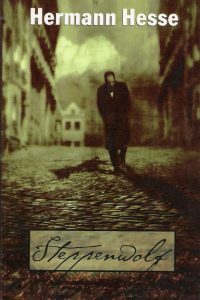 Herman Hesse’s 1927 novel, Steppenwolf¸ in many ways expresses the profound doubts and conflicts Hesse went through at the time that he was writing the novel. The book explores the idea that all people have within them multiple and conflicting aspects of their nature. In Steppenwolf, the protagonist seems to be made of two main character types, the wolf and the civilized man. Hesse’s novel actually gives us the idea that we are all made up of many more types than just the two dominant types in Harry Haller. As we are forced by civilized society and the demands of adulthood to only express one feature of ourselves, we begin to slide into despair and even suicide. This tendency is at the heart of all internal conflict in Hesse’s philosophy, at least as it is expressed in Steppenwolf. By being forced to live with only one aspect of ourselves, the other parts become starved and begin to die. We lose contact with ourselves and thus our will to live. As the novel progresses, we are even given a “Treatise in the Steppenwolf” which explicitly details the problem of multiple types within the human heart. As the novel explores this idea, we are led through mystical ideas and other forms of thought which are derived from the work of Jung. Jung’s archetypes operate as firms explanations for this otherwise mystical idea. Beyond the multiple nature of humanity, other philosophical ideas come out. The idea of the eternal seems to underlie the multiple types and how we are to negotiate life with this issue. Magic, dance, and sexual abandon also emerge as important aspects of the mystical journey of the main character, Harry Haller. The novel ends on an unsatisfying note. We never get any firm answers to the questions raised in the book, and perhaps this is a point to consider as we read the novel.